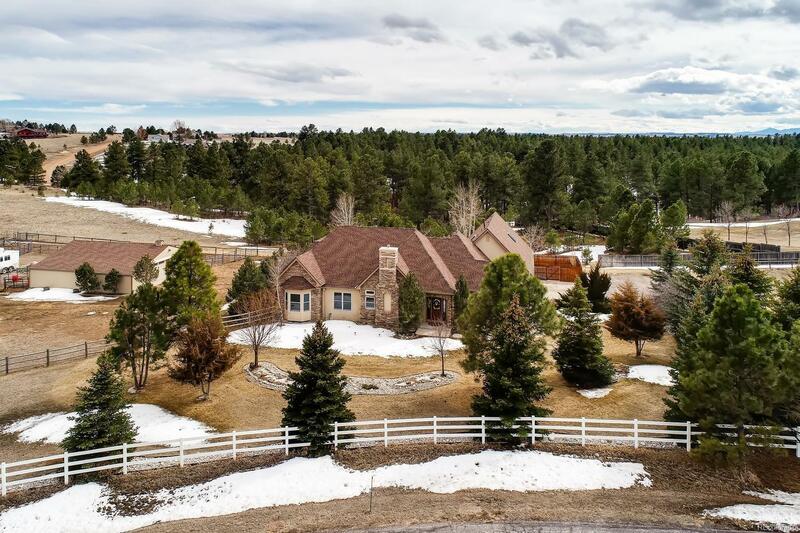 This is the Colorado ranch home you have always dreamed of! White picket fencing with beautiful pines and nearly 5 acres to roam. Equipped with a 4-stall horse barn, arena (round pen and automatic Nelson waterers), and pasture; for all your equestrian needs. Completely remodeled kitchen including granite countertops, gas range, and stainless steel appliances. Stunning open floor plan with vaulted ceilings and main floor master bedroom. Additional guest suite (or potential mother-in-law suite) upstairs complete with full bath and skylights. Whether you feel like cozying up to the fireplace or relaxing in the hot tub, this property will not disappoint. New stamped concrete back patio, gas hook-ups for grilling and a fire-pit provide for the perfect outdoor entertaining space. So many features, including NEW furnace, air conditioning, water heater, and well pressure tank (all 2 years old) and newer roof on the home and barn (4 years old).